It didn’t break through the coverage of the presidential election or the meltdown of our financial system, but corporate welfare was center stage at the Capitol last Friday. 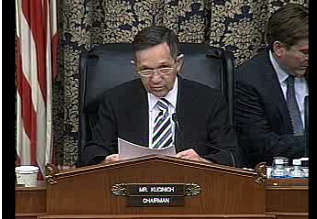 In his fourth Congressional hearing into the economic benefits – or lack thereof – of taxpayer-subsidized stadiums, Rep. Dennis Kucinich (D-Ohio) summoned to Washington the masterminds of America’s most expensive stadium: the Yankees’ new palace going up in the South Bronx. There was Randy Levine, President of the Yankees; Seth Pinksy, President of the New York City Economic Development Corporation; Martha Stark, Commissioner of the New York City Department of Finance defending the project. Also testifying was Assembly Member Richard Brodsky who as Chairman of the state’s Assembly Committee on Corporations, Commissions and Authorities is conducting an investigation into the use of public financing for the project. Community benefits agreements are changing the power dynamics of local economic development in many parts of the country. Among the most important of the benefits that these agreements can bring about are high-quality jobs for low-income workers. 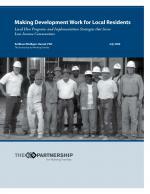 The Partnership for Working Families (PWF), which is spearheading the CBA movement, recently published a report, Making Development Work for Local Residents, that describes the gains that have been made with local hiring programs. Written by Kathleen Mulligan-Hansel, the study finds that “the best local hire programs create first source referral systems to coordinate worker recruitment and screening, liaise with developers and employers, refer workers and support them as they navigate the hiring process, and link workers with support services that can help them stay on the job.” The report emphasizes the need to recognize the significant differences between the hiring process for temporary construction jobs and for permanent positions at the development site. The findings in the report are based on nine case studies, mostly in California. One of the most successful was the Hollywood and Highland Center project, which included construction of the Kodak Theatre, now home to the Academy Awards. In the project, completed in 2001, 19 percent of the construction hours were worked by local residents, and 36 percent of the permanent jobs went to locals. PWF is using the release of the report to kick off a broader effort to use local hiring programs to transform regional economies. That effort includes the launch, in cooperation with Cornell University’s School of Industrial and Labor Relations, of the Construction Career Opportunities Project. Its goal is “to identify, study, support and promote promising approaches to elevating union density in the construction industry and increasing access to building trades careers for low-income urban residents.” That’s real development. Chicago city government faces a two-year deficit of at least $469 million, with additional massive shortfalls looming through 2012. Mayor Richard Daley has proposed some draconian steps: laying off over 900 city workers, eliminating over 1,300 unfilled positions, raising city amusement and parking taxes, and imposing six days of unpaid leave on “non-essential” city employees. Daley blames the unexpectedly large deficit on the economy, but others are citing causes the mayor is not eager to discuss, such as the city’s overuse of tax increment finance districts (TIFs). Chicago had 37 TIF districts in 1997; it now has 155; they can last 23 years and even be extended 12 years beyond that. 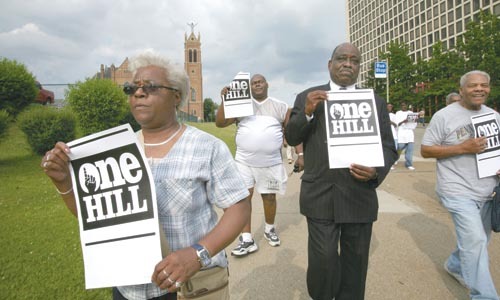 The original purpose of TIF in Illinois was to help genuinely “blighted” neighborhoods. However, under Daley, Chicago has been a leader in making TIF an all-purpose development and attraction tool even in already thriving or growing parts of Chicago, including the commercial/financial powerhouse called the Central Loop. In their analyses of the city’s budget crisis, both dailies, (the Tribune and the Sun-Times), and an alternative weekly (the Reader) have all cited TIF’s massive diversion of property tax revenue –now $500 million annually –from city services, schools, parks and other local services. The revived debate over TIF’s harm to public services is a tribute to the now-defunct Neighborhood Capital Budget Group. As their ground-breaking 2001 study “ Who Pays for the Only Game in Town? revealed, many Chicago TIFs are in areas that were the opposite of blighted. Now the high price of diverting revenue from areas that were already rising in value without the TIF boost is coming home to roost.